NextGen Player was on hand this past weekend to check out the massive Best Buy Canada 'Gaming Invasion 08' party that happened downtown Toronto at the Yonge-Dundas Square. It was an amazing event with dozens of gaming stations set-up playing the hottest games available this holiday. 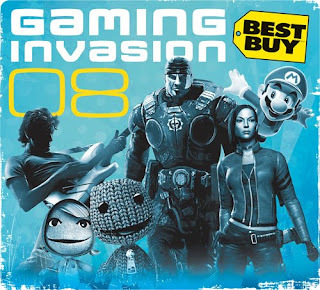 There were even a number of games playable that have not hit retail shelves including LittleBigPlanet, Gears of War 2, Guitar Hero World Tour, MotorStorm Pacific Rift and Resistance 2. What I found most impressive about the event was the huge, dedicated tent erected solely to promote Sony's LittleBigPlanet. Immediately inside the tent you were greeted with wall-to-wall images of Sackboy, in-game scenery and characters, as well as text reinforcing the game's motto of play, create, share. I even got my picture taken in front of a huge Sackboy sticker wall that Sony is supposed to be posting on their website sometime this week. Once I get my hands on the photo I'll be sure to share on NextGen Player. For those interested, here are some photos that Matt Vernhout and I took this week at Gaming Invasion '08. Enjoy!